A few weeks ago, I wrapped up my Master Coach training with Martha Beck. The opportunity to be coached by Martha over several days on her ranch was an experience that will remain with me for a long, long time. For those of you that don’t know her, she’s been a Life Coach since before there was any such thing as a Life Coach, authored several best-selling books and has been writing a featured column in O Magazine for decades. But the thing that is so incredible about Martha Beck’s coaching style is that she coaches being completely present, transparent, and following her intuition. As a coach, when we let go in that way and allow ourselves to be guided, deep insights and small miracles can occur. One of the things she taught us over that long weekend was how to allow fear and calm to be fully present at the same time. It’s incredibly powerful because when we can do that, our fear no longer drives our choices and actions. That voice in your head that tells you to be careful, don’t trust, play small, who do you think you are? For me, my fears typically circle around and around the thoughts of spending my savings, me or someone I love getting hurt, and not becoming all that I could. People will think I’m…if I…. Step One: Go out into nature. Nature is a place where you can let your guard down because nature never lies. Find a place of stillness where you stop worrying about the rest of the world and just be for 10-15 minutes. Step Two: Invite God / Source / The Universe to awaken you. Just keep repeating the loving kindness mediation over and over while in stillness for at least 5 minutes; even if you don’t mean it, keep saying it. You don’t have to solve the problem. You don’t have to deny the fear or push it away. 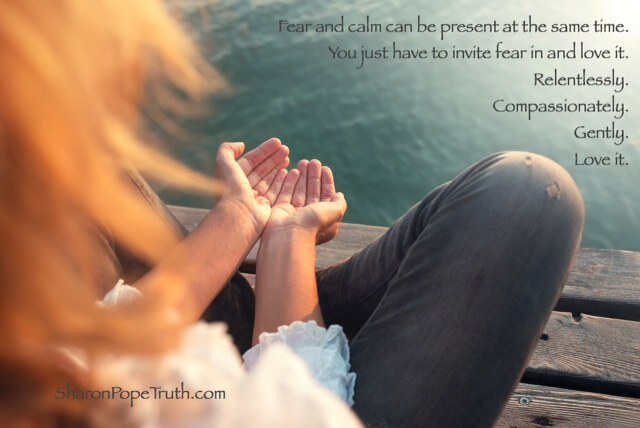 Just allow the fear to be present with you in that safe space and keep offering yourself relentless compassion. When I did this exercise myself, the fearful chorus that had been playing in my head for years quieted. I was able to hear and feel a deeper truth about each of the fearful thoughts. During that session I also had a fear that I didn’t even know I was carrying bubble to the surface. It was a part of me that I had denied and suppressed, a part of me that I thought I had shed years ago. I was afraid that I would go back to being the person I was many years ago who knew how to fight when cornered. When I offered that part of me loving kindness, it was no longer important to shut that part of me down or deny its existence. All I had to do was allow it to be present and love it.